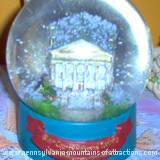 A Central Pennsylvania Architectural Showplace! 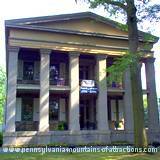 Built in 1849 Baker Mansion is known as a museum of Central Pennsylvania History. It is now the home of the Blair County Historical Society. 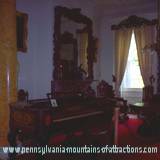 Altoona, PA is proud to show off its historic Greek-revival style 28 room Baker Mansion, along with its Victorian Style furniture from that era. The Historic Mansion was originally the home of Ironmaster Elias Baker and his family. 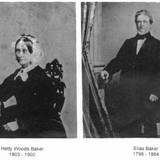 Mr. Baker brought his wife, Hetty, and sons Woods and Sylvester to this area from Lancaster County in 1836. Elias Baker and his cousin purchased the Alleghany Furnace. They settled in a modest home near the furnace where shortly after their arrival, a third child, Anna, was born. Another daughter, Margaretta, was born in 1839, but she died of diphtheria at age two. In 1844, Mr. Baker bought out his cousin's share in the Allegheny Furnace, and later that year contracted with Baltimore architect Robert Cary Long, Jr. to design him a grand home. The result was this Greek-revival style mansion, completed in 1849 at the cost of $15,000. The exterior walls are faced in limestone, originally faced in lead, and much of the decorative work is made of iron, cast at the Alleghany Furnace. Inside, the house features black walnut woodwork, fireplaces of Italian marble, and a suite of hand-carved oak furniture imported from Belgium. Another part of the Baker Family History and now an important piece of Historic Central Pennsylvania is what is now known as "America's Oldest Gasoline Station" , built in 1909 as a Blacksmith Shop. This Gasoline Station is sill in operation in Altoona, PA. The Bakers occupied the mansion until 1914 when Anna Baker died. Have you heard the stories of Elizabeth Bell's wedding dress that is on display at Baker Mansion and the ghostly tales at this haunted mansion? 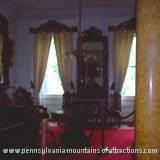 Many visitors to the old mansion along with employees have reported seeing many ghostly creatures throughout the mansion. 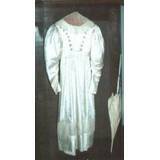 Elizabeth Bell's wedding dress is no longer on display at Baker Mansion, due to years of deterioration caused by exposure to light and air borne pollutnants. 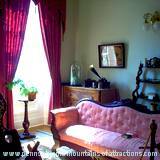 Below you'll find a schedule of tours at Baker Mansion. There is always a haunted tour in celebration of Halloween. You really never know when you'll run into activity in this popular haunted mansion. The Blair County Historical Society officially came into existence on July 23, 1906. To promote the discovery, collection, preservation and publication of the history, historical records, and data of and relating to Altoona City and Blair County, the collection and preservation of books, newspapers, maps, genealogies, portraits, paintings, relics, engravings, manuscripts, letters, journals, and any and all materials which may establish or illustrate such history, the growth and progress of population, wealth, education, agriculture, arts, manufactures and commerce of Altoona City and Blair County. Preserving Pennsylvania History, especially the Civil War Era wasn't an easy task. Finding a building with enough space, historic significance, and architecture wasn't easy. In February 1922, the society learned that old Baker Mansion might be available. The impressive Greek-revival mansion, built by Ironmaster Elias Baker in 1849, had been vacant since 1914 when his daughter Anna Baker died. The society leased 10 rooms in the National Historic Landmark for $1.00 a year, plus the cost of utilities. After weathering the Great Depression the Blair County Historical Society purchased Baker Mansion in 1940 for $10,500. Through membership and contributions the Society paid off the remaining debt and took clear title of this National Historic Landmark in 1948. Regularly Scheduled Daily Tours will begin on Thursday, June 9, 2011 and run through September 9, 2011; Thursdays through Sundays; 11:00 a.m. - 3:00 p.m.
Before June 9, 2011 and after September 9, 2011 tours will be available by appointment only. A full tour of Baker Mansion will take 1 to 1 1/2 hours. Groups of fifteen or more persons may schedule tours at other times throughout the year. Group tours should be scheduled at least one week in advance. The office and research library, on the third floor of Baker Mansion, are also open Tuesday and Friday from 9 a.m. to noon. The charge is $3.00 per person per day. Members of the Blair County Historical Society may use the research library at no charge. 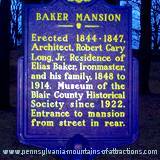 The Blair County Historical Society looks forward to welcoming you to Baker Mansion and showing you through this Historic Pennsylvania Landmark and its treasures from the past.